Digging and loading loose and semi compacted material such as earth, sand, gravel and clay. Digging and loading hard and abrasive materials like rocky soil, blasted rock and limestone. 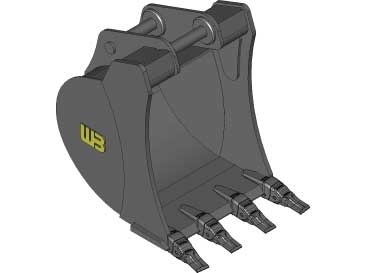 The reduced tip radius enables the bucket to cut through the ground more effectively with minimal resistance and drag. Pin to Point dimensions are near the OEM specification for maximum breakout force.The buckets profile increases penetration for faster cycle times. 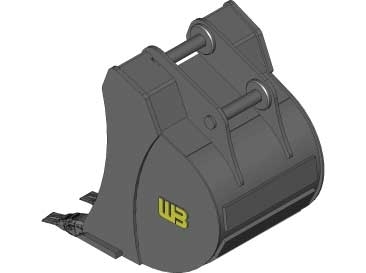 The Recessed Pin Coupler Bucket provides maximum digging efficiency leaving behind little wasted material for improved production. High quality T-1 steel is utilized in all critical or high wear components to ensure that this bucket has a long operation life. Heavy duty cast material is used in the buckets cutter bit. The cutting edge is backed by a heavy reinforcing plate with heavy duty wear straps protecting the bucket bottom. Each bucket is engineered with tapered side plates to reduce wear on the buckets sides, and to allow for easier dumping.